The Easter Bunny visited BlueCotton and scattered Easter Eggs all over our site! Join our Easter Egg hunt�.every egg�s a winner! 1. 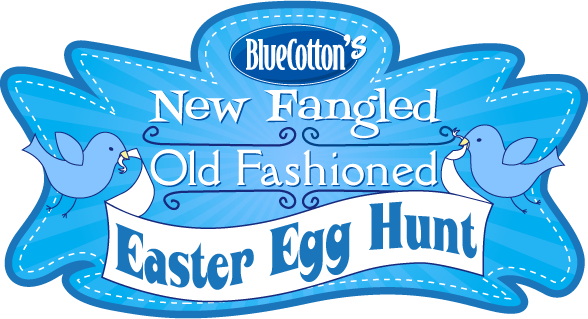 Find one of the eggs hidden on the BlueCotton.com website. 2. Write down the code written on the egg. 3. Enter the code in the entry form on this page. 4. You will be notified of your prize via email by May 7th. Thanks for participating in the BlueCotton Egg Hunt. The Grand Prize winner will be announced and posted here by May 7th. 1. In order to participate in the Event, you must agree to these Official Rules. 3. One prize per household. 4. Contest Period. The Contest begins on April 14, 2011 at 6:00:00 A.M. CT( Central Time). The Contest ends on April 24th at 11:59:59 CT. ( Central Time). 5. All participants will be notified of their prize between May 1st and May 7th. 6. Winner List. The name of the Grand Prize winner ($250.00 Voucher) will be posted on the Contest Website by May 7th. 7. By participating in the event, you agree to future emails from BlueCotton.com. BlueCotton will collect your email address in order to participate in the event. 8. BlueCotton is not responsible for electronic transmission errors resulting in omission, interruption, deletion, defect, delay in operations or transmission. BlueCotton is not responsible for theft or destruction or unauthorized access to or alterations of materials, or for technical, network, telephone equipment, electronic, computer, hardware or software malfunctions or limitations of any kind. BlueCotton is not responsible for inaccurate transmissions of or failure to display materials account of technical problems or traffic congestion on the Internet or at any website or any combination thereof. If for any reason the Internet portion of the event is not capable of running as planned, including infection by computer virus, bugs, tampering, unauthorized intervention, fraud, technical failures, or any other causes which corrupt or affect the administration, security, fairness, integrity, or proper conduct of this Contest, BlueCotton reserves the right at its sole discretion to cancel, terminate, modify or suspend the Event. 9. No Recourse to Judicial or Other Procedures. To the extent permitted by law, the rights to litigate, to seek injunctive relief, or to any other recourse to judicial or any other procedure in case of disputes or claims resulting from or in connection with this Event are hereby excluded, and you expressly waive any and all such rights.